This is a Charles Blackman Fine Art Limited edition archival rag mat paper print titled “The Meeting”, it is also available in a fine art Camvas version with an image size of 120x120cm, The meeting is made from the original Charles Blackman 1961 Oil Painting, It is Hand Signed lower right by Charles Blackman, “The Meeting” by Charles Blackman is available at Etching House framed or unframed, it is also available on 12 months lay Buy with 20% deposit , see Etching House terms and conditions. 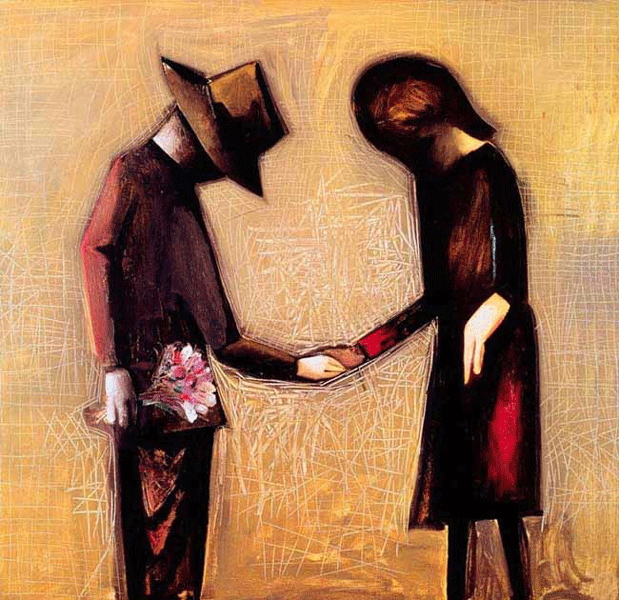 Each 1961 Oil painting fine art limited edition reproduction print is hand signed by Charles Blackman and carries the Charles Blackman embossed logo showing in the lower left of the sheet. Image size – 65 x 67 cm. Paper size -76.5 x 77 cm. These Canvas prints are hand signed and come with a certificate of authenticity.